Information here is intended to give a better understanding of the historical uses of these Northwest Native Plants and not as a recommendation for their use. Please use caution when preparing or eating any parts of all plants. Identification of the species and knowledge of a plant's toxicity are both essential before using any plant species medicinally or otherwise. Please consult with a health professional before attempting to treat any ailment. 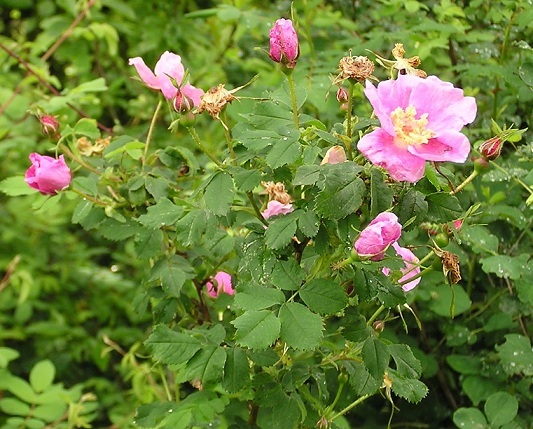 Every part of this wild rose will be used by nature. Some parts are valued for multiple reasons. For instance: the ripe hips are favorite food of birds, delicious source of vitamin C for humans, terrifically poignant as a winter tea, lovely in a vase with some cedar or fir sprigs for visual pleasure, and a surprisingly fulfilling snack to brighten up your mouth. Alnus rhombifolia White alder Circulation, skin disorders Bark, leaves Dry bark, make into decoction for circulation. Use leaves fresh--Parkinson wrote in 1640 that this has a cooling and drying effect on skin, stays inflammation. Aquilegia Columbine Arthritis, biliousness and dizziness, diarrhea, sore throat Roots, leaves Mash roots and rub on aching joints. For biliousness and dizziness, boil leaves and roots together and take in 1/2 cup doses several times a day for a couple of days. Boil roots and drink tea for diarrhea. Chew leaves for sore throat. Arctostaphylos columbiana Hairy manzanita Bronchitis, poison oak Fruits, leaves Make fruits and leaves into tea for bronchitis. Fruits are made into tea and used as wash on poison oak. Asarum caudatum Wild Ginger Emetic, cathartic, errhine, whooping cough, flatulence, indigestion, fever, cold, heart condition, sweat lodge, expectorant. Rhizome, dried; also roots Some say it promotes sneezing, helpful for head colds. Make into tea. Fragaria Wild strawberries Diarrhea Root, fruit and leaves Roots are good for diarrhea. Fruit and leaves are laxative, diuretic and astringent for skin. Heracleum lanatum Cow parsnip Rheumatism, sore throat, toothache Roots Mash, soak in water and use infusion as gargle or apply as poultice. Native Peoples used pieces of roots inserted in tooth cavity for toothache. Mahonia Oregon Grapes Tonic and alterative, psoriasis, syphilis, impure blood conditions, acne Root, leaves Root is good for ulcers, sores, and as tonic. Chew fresh leaves for acne. Mimulus guttatus Monkeyflower Astringent, wounds Root, leaves and stems Root is astringent. Use raw leaves and stems as poultice for wounds. Oxalis Wood sorrel Nausea, mouth sores, poultice, urinary infections, scurvy, sore throat Leaves Chew fresh leaves for nausea or mouth sores. Use fresh leaves for poultice. Brew leaves as tea for urinary infections, scurvy and sore throat--rich in vitamin C.
Pinus contorta Lodgepole pine Bandage, sore throat Pitch from bark, buds Pitch from bark is natural bandage. Chew raw buds for sore throat. Pinus monticola Western white pine Rheumatism, kidney trouble, boils and coughs, stomach disorders Young shoots, bark Boil young shoots for rheumatism, kidney, boils and coughs. Bark is boiled and made into decoction for stomach disorders. Quercus Oaks Skin disorders Acorns Prepare meal, allow to mold. Scrape mold off and store in damp place. Used for boils, sores and other inflamations. Rhamnus purshiana Cascara, chittam Laxative, cathartic, tonic Bark, berries Long used by Native Peoples who introduced early Spanish settlers to the plant. The Spanish called it Cascara Sagrada or "sacred bark." Natives would girdle the tree at two points three feet apart and make verticle cuts between, then peel off bark and dry it. For tonic, put small piece of bark in water for 12 hours, remove bark and drink water. Ribes aureum, Ribes cereum Golden currant, Red currant Antiscorbutic, antiseptic, aperiant, refrigerant Fruit Do not store in metal container! Will create deadly poison! Make jelly of fruit and apply to burns. It will ease pain and prevent blisters if applied immediately. Symphorocarpos alba Snowberry Colds and stomach-ache, laxative Roots, fruit Pound roots and steep for colds and stomach-ache. Fruit acts as laxative. Caution: leaves are poison! Umbellularia californica Oregon myrtle, California bay Anesthetic, headache Leaves and seeds Oil from leaves and seeds are anesthetic. Native peoples placed leaves on head and covered for headache. If leaves are held under nose, it is said to cause headache or sneezing! Vitis californica Wild grape Diarrhea, hepatitis, stomach-ache, sore breast, external cuts Leaf Tea from leaves good for diarrhea, hepatitis and stomach-ache. Poultice will ease sore breasts and external cuts.